One of the most asked questions I get when I tell someone I’m a playwright is ‘What do you write?’. When I hear that question I’m probably already in the brace position because that question is not ‘why’ (because I have to and would combust if I didn’t) or how (pen to notebook diagram, diagram to keys on the computer, rarely in mornings, usually best at about 8.00pm). As I crouch on the floor with my hands around my head I’ll mumble something like – ‘well, drama, y’know plays’. And they’ll come back with are the funny or serious and I’m all ‘not comedy-comedy but not humanity is doomed and we’re all going to die alone either’ and by then I’m probably rocking. Maybe only Harold Pinter could have answered that question (‘well, there are these men in a room…’) and, let’s be honest, it’s not a very interesting question, is it? 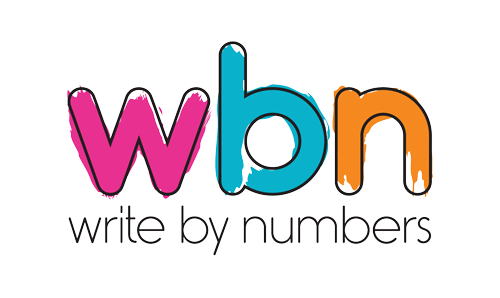 A writer can write about anything, yes we’ll have our own ticks and quirks but the ‘what’ – that can be huge. Or HUGE, as it should probably be given my current prediliction for capitalisation. By giving all of our writers the ‘what’ in Ovid Reworked (stories from Ovid’s Metamorphoses) we’ve removed that question. Yes, they may be comic or tragic or one of the endless shades in between but I like to think that getting the ‘what’ out of the way allows us to look at more interesting things. Like ‘how’. And since we’re specifically talking about plays – how does it go from story-to writer-to director-to stage? If I were being flippant then my answer to that for this project would be ‘quickly’. I did an interview for IdeasTap a few days ago and when they asked me what I liked about working in Empty Shops I posited about how the need to create (and discard) quickly is extremely liberating. Having a theatre-space which we can programme to our whim and will allows us to take lots of risks. And one of the plays we debuted today I think demonstrates this beautifully. A week before we moved into the space we went out into Brixton to do a photoshoot for promo material. Retreating from the cold we went into a local cafe/bar where one of our Directors, Estelle, started having something of a quick read-through of lines with two of our actors. Our waiter noticed the script that was being read (The Fall of Troy as it turns out) and asked what we were doing. And so it emerged that our waiter, Eddie Molloy, not only knew his Ovid but was something of a writer. Ten minutes later, Eddie had agreed to write a short adaptation of the story of Narcissus and Estelle had agreed to direct it. In terms of risk and possible insanity in terms of curating a festival this stands out. Not just for us (in as much as we’d never met Eddie before and that there’s always the potential for the elephant in the room of ‘can this person write’) but for Eddie. Writers can be spikey and self obsessed (hello, have we met?) and whilst I’m sure Mr Molloy doesn’t have the worst of my writerly characteristics he was still investing the time and energy into producing a script for a theatre company he had bumped into in a cafe. But having an empty shop gives you license to do all those things you couldn’t do elsewhere – like engage a Brixton writer to write for you with less than a week to go to opening day. To be entirely serious (momentarily) it would be wrong for us to play ‘safe’, particularly when the Brixton Village Market project as a whole is about engaging Brixton and embracing risk and experimentation and imagination. Eddie duly delivered his script in the middle of last week and when I read it and saw how enthusiastic Estelle was about directing it I was glad we’d taken this risk. We always wanted to make writers do unsual things and I think this spectacularly counts as an unusual thing. When I read Narcissus we didn’t have an actor for the role (and we have, to put it politely, already had one WHERE ARE ALL THE MALE ACTORS? stress) but, rather fittingly, Edward Cartwright was recommended to us on the strength of a monologue he’d previously performed. 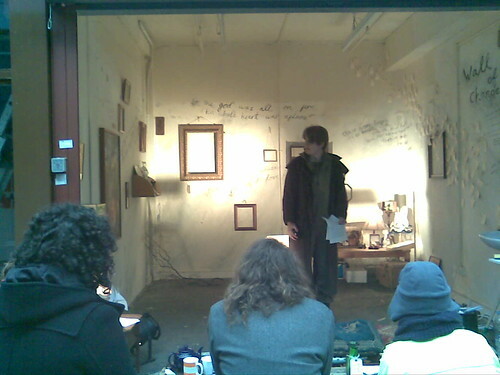 Less than forty eight hours after Edward got the script he was performing in Shop 82. With a gas mask. Because sometimes, just sometimes, life and making theatre is like that.